Ah, I love iLuv products. If I haven’t made that pun before, then I guess I apologize, because it really is obvious. Just in time for back-to-school, the company releases its TimeShaker Micro. It is pretty clear why it is called the TimeShaker Micro, because it is an alarm clock that can wake you up with a tiny shaker that vibrates when sleepy-time is over. This is good for college students, to wake up without disturbing the roommate. It’s also good for couples, too. Of course, you might want to listen to music, and loud too. Fortunately, the TimeShaker Micro comes complete with stereo speakers. You can stream your music from your Apple or Android phone, or you can just plug it in to the 3.5 mm jack. There is also the option of an FM radio. Then there is also the LCD display clock, so it looks like an old clock/radio. 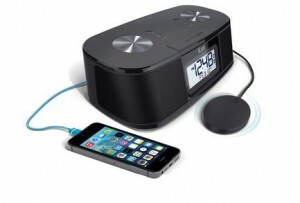 This one can also charge your devices, not like an eighties clock ratio at all. If you are interested in purchasing a TimeShaker Micro for you or someone else, you can check it out here for $49.99.